Wellfleet Town Hall is located at 300 Main Street, Wellfleet, MA 02667; phone: 508-349-0300. Photo: Peter Kugel House (Kugle-Gips House), ca. 1970, Long Pond Road, Wellfleet, MA. 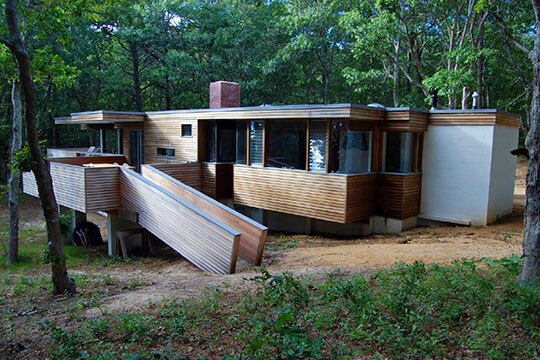 Modem style vacation residence designed by local architect Charles Zehnder in 1970 for Boston College professor Peter Kugel. Listed on the National Register of Historic Places in 2014. Photograph by Virgina H. Adams, C2009, for nomination document, Peter Kugel House, Barnstable County, MA, NR# 14000019, National Park Service, National Register of Historic Places, accessed September, 2014. Wellfleet was settled prior to 1724 and incorporated in 1763, prior to which it was part of the Billingsgate section of Eastham. Whaling and oystering were the principal enterprise until the British blockade during the Revolutionary War brought all industry to a standstill. While the community became destitute, it was revealed through court records that Colonel Elisha Doan, the town's wealthiest man, reaped a fortune by trafficking with the enemy. After the Revolution, Wellfleet traders regained prosperity by barter with England and France, until the Embargo Act of 1807 again interrupted business. In 1850 Wellfleet, with a fleet of 30 vessels, had become second only to Gloucester as a port for trading cod and mackerel. From 1830 to 1870 the town enjoyed a virtual monopoly of oystering in New England. Over time, the oyster business gave way to tourist trade.